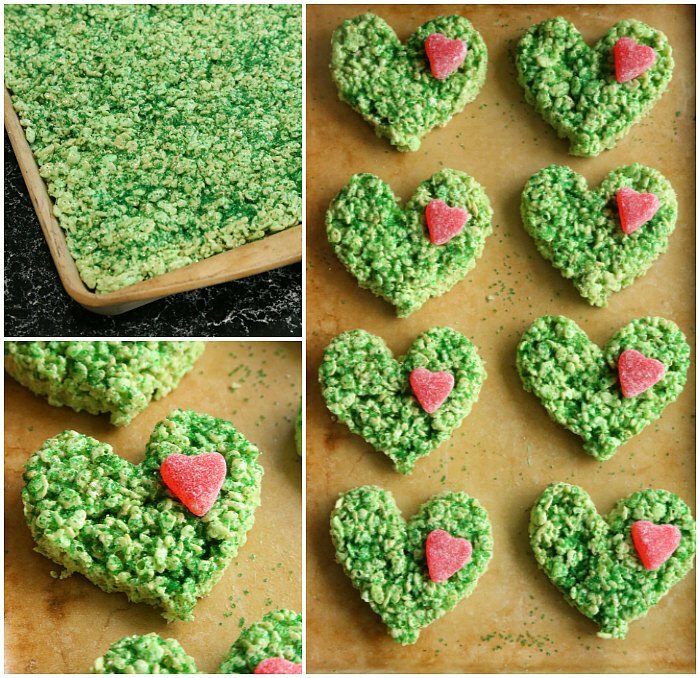 “Well, in Whoville they say– that the Grinch’s small heart grew three sizes that day.” Have some delicious movie night fun with these Grinch Heart Krispie Treats! Who else loves the Grinch? It’s Baby Brother’s absolute favorite at Christmas! 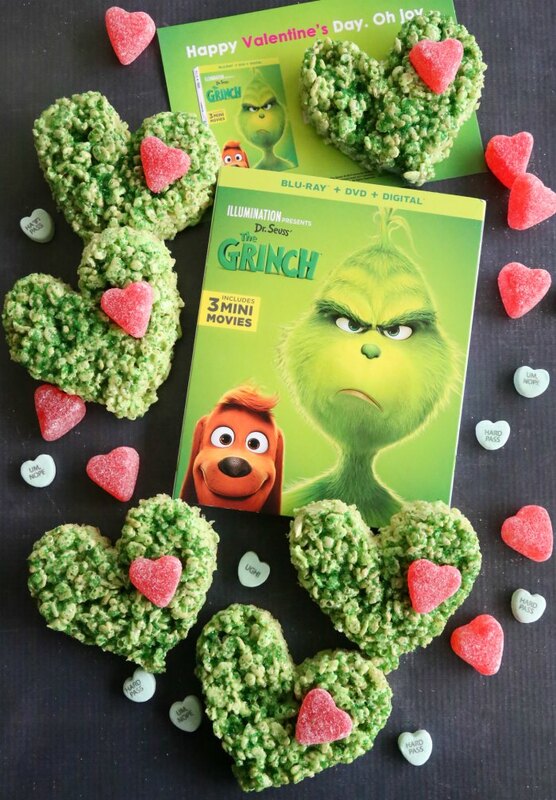 So, we were thrilled to get sent a copy of Universal Pictures Home Entertainment’s Dr. Seuss’ The Grinch (releasing on Blu-ray/DVD on February 5, 2019) for review! 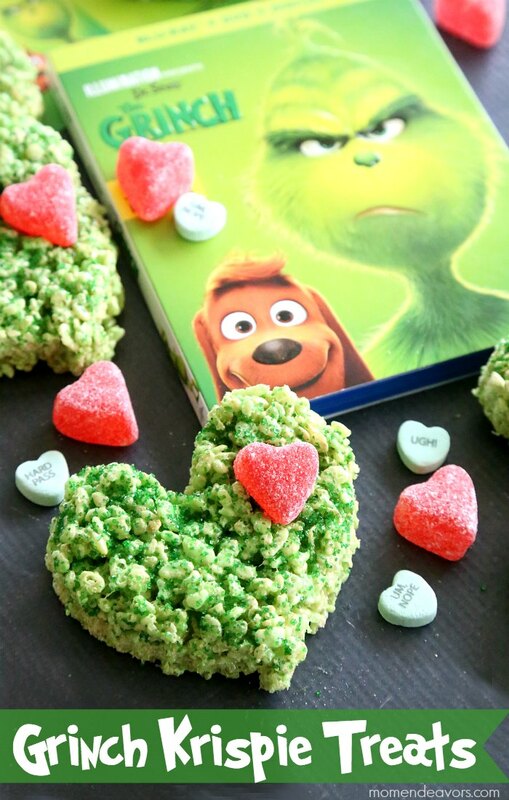 To celebrate, I made these gooey, green Grinch hearts – a seriously delicious movie night treat! Read on to enter to WIN your own! 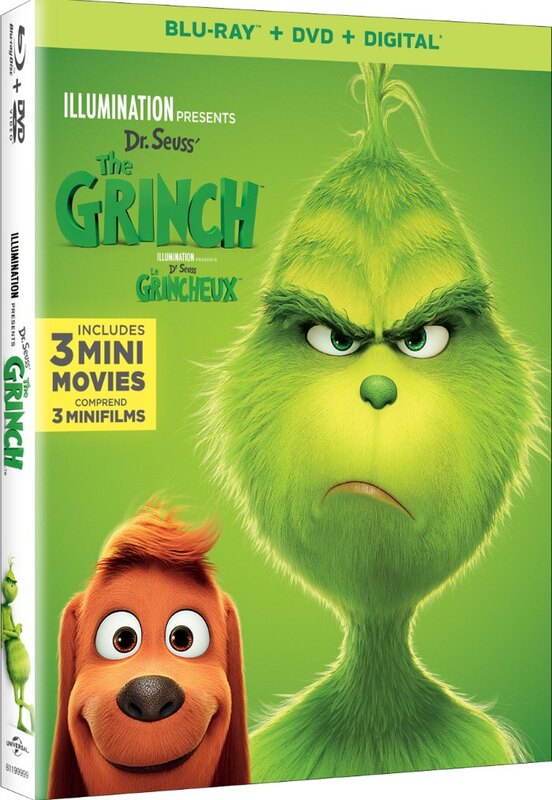 The new home entertainment edition contains more than 60 minutes of bonus content, including three mini-movies: “Dog Days of Winter” starring theGrinch and his heroically loyal dog Max; and “Yellow is the New Black” and “Santa’s Little Helpers,” both starring the lovable Minions. It also includes stunning featurettes, a how-to-draw tutorial and much more. Narrated by Grammy Award®winner and Oscar® nominee Pharrell Williams, Dr. Seuss’ The Grinch stars Academy Award® nominee Benedict Cumberbatch (Dr. Strange, “Sherlock”) as the infamous Grinch, who lives a solitary life inside a cave on Mt. Crumpit with only his loyal dog, Max, for company. The incredible voice cast includes Rashida Jones (“Parks and Recreation,” The Muppets) as Donna Who, Kenan Thompson (“Saturday Night Live”) as Bricklebaum, Cameron Seely (The Greatest Showman) as Cindy-Lou Who, and featuring legendary actress Angela Lansbury (Anastasia, Beauty and the Beast) as the mayor of Whoville. Funny, heartwarming and visually stunning, Dr. Seuss’ The Grinch is a perfect night in for the whole family! From Green to Screen – It takes a lot to bring grumpy green to your home screen. This inside look at the making of Illumination’s Dr. Seuss’ The Grinch features interviews and behind-the-scenes moments with the cast, filmmakers and artists whose hearts have all grown three sizes bringing this classic tale to life. My Earliest GRINCH Memories – The cast and filmmakers of Dr. Seuss’ The Grinch reveal their earliest memories of the grumpy green character and the enduring appeal of this Christmas curmudgeon’s journey to redemption. Songs From His Little Heart – Take a deep dive into the toe tapping beats of Dr. Seuss’ The Grinch. From score to specialty songs, you’ll hear from the film’s A-list musicians on what it took to create the music behind the movie. My kids love the Grinch. They watch him every time he’s on. “Tell us your favorite thing about The Grinch story or this prize pack!” My favorite thing is how funny and ridiculous the Grinch is! I love the movie because it ends on a feel good note! I love how The Grinch’s whole attitude changes in the end! I love that the movie shows that people can change for the better if you give them the chance. I love the Grinch. It is my favorite holiday movie. I like how he changes and the ending. I also love the reindeer. I love the Grinch. He is so cute and funny. 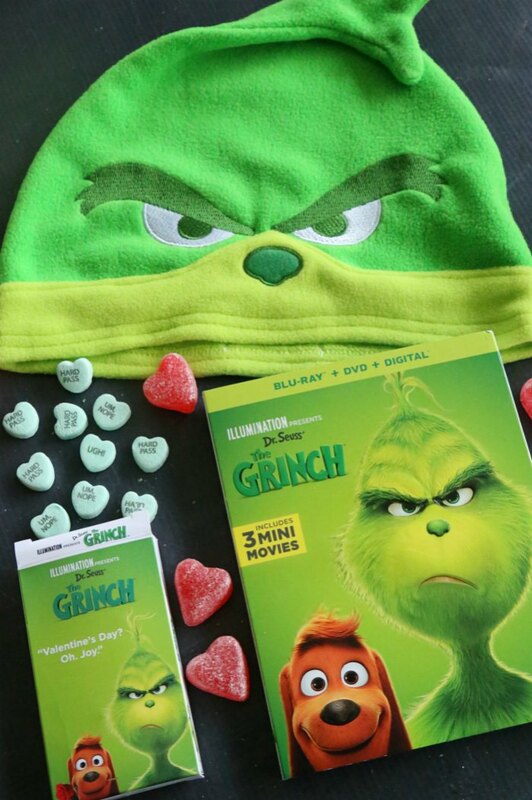 I really like the Grinch beanie in this prize pack. I like how a little girl can make a big impact! My little three-year old grandson watches the Grinch movie with Jim Carey every night before he goes to bed. He loves all things Grinch and is really looking forward to the DVD being released so he can watch the new “Ginch” (he’s three and has the adorable three year old voice) every night. 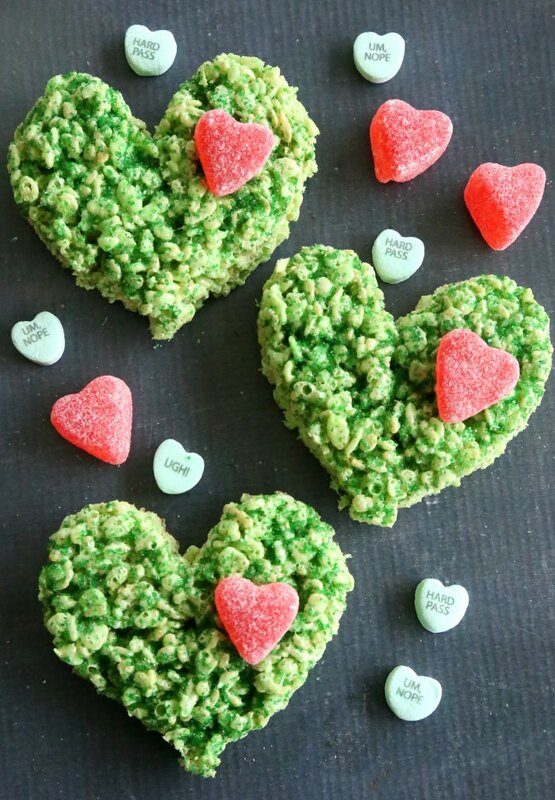 Those Grinch candy hearts are pretty cool. I think that we really enjoy the characters and the humor. I love that the Whos don’t need stuff. I have loved the Grinch since I was a young girl! I just love how he has a change of heart and love the good ending! My favorite part of the prize pack is the Bluray Combo Pack with the 3 mini movies! I like that the Grinch has a change of heart. I like when the Grinch takes the Who hash. I like the Grinch story because it shows that bad people can change. My favorite thing about the Grinch story is that in the end he has a big heart. I’m loving this prize because my children haven’t seen this movie yet. It looks like a fun movie! The hat is so much fun! My favorite part of the Grinch story is that it is a timeless tale that helps to teach children and adults a lesson. Learning to be kind never goes out of style. My niece and nephew love the relationship between the Grinch and Max. 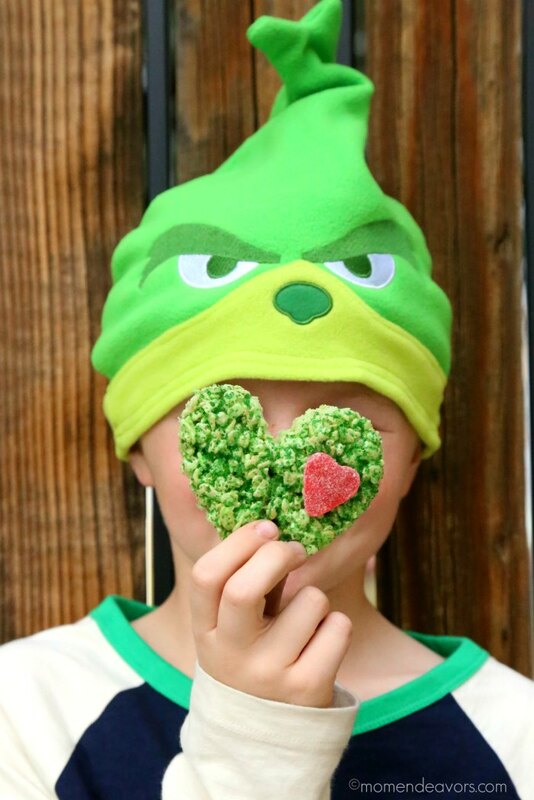 My favorite thing is the beanie, my grandson loves The Grinch and he would look so cute in it. My granddaughter loves the Grinch. She would really love to have the movie and the hat. I think the messages on the Grinch conversation hearts are really cute! My granddaughter will really like the Grinch hat. We liked this Grinch movie a lot ….Quite funny..
We love the Grinch. To me it means the Christmas season is beginning. I can watch it over and over. I like The Grinch’s change of heart. I always love at the end when they join together and sing. Always a good thought to keep that even on the worst day there are better things to look at. We love Grinch. It’s not just a Christmas movie for us. It’s a all year long movie for us. Thank you! The different facial expressions that the Grinch makes.